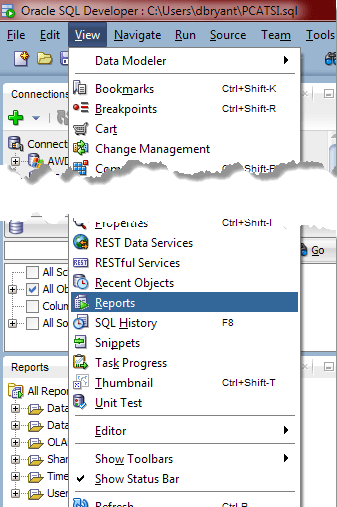 Migrating SQL Developer User Defined Reports. I’m in the process of upgrading my work computer and in an effort to make sure it is configured the way I want it, I decided to forego the automated “side-by-side” migration. Everything was going well until I got around to SQL Developer. The install as we know is easy enough, and I even went so far as to download and configure the Oracle Instant Client (OCI). You can read more about that on Jeff’s Blog post. The first thing I need to do is find out where these reports are stored on my computer. With a bit of luck, I was able to find the UserReports.xml file in this directory: C:\Users\username\AppData\Roaming\SQL Developer\. Sometimes, this folder is hidden, so you will need to make sure that your folder options are configured to show hidden files. Simply copy this file and paste it into the same directory on your new machine. 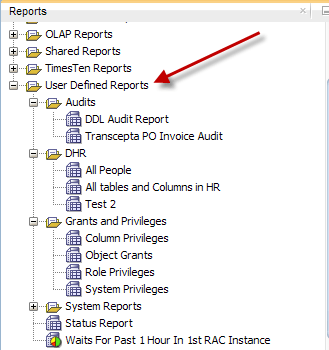 Start up SQL Developer and your User Defined Reports should be there ready to run. Now that you know where this file is, other options include storing this on a shared drive or cloud resource such as Dropbox. This will allow your development team to share a “report repository.” Along the same vein, take a look at this post I did last year about running SQL Scripts via HTTP in SQL Developer. This method lets you access your scripts from a web server.